Does Burn the Fat Deliver? Is Tom Ventuo Really all he’s Cracked up to be? Burn the Fat Feed the Muscle. It costs 39.95.It’s over 300 pages. And when I printed it out I need to buy a new ink cartridge. It weighed just under 2lbs. Yes I actually weighed the book. Why would I do that you ask yourself…well the reason, clichéd is as it may be, is because I wanted to know if it was worth its weight in gold. I am telling you should by this book. Right now. Don’t question it, don’t phaff around debating it and procrastinating…buy it. Now. Don’t worry I’ll wait…..got it yet? Okay why am I recommending this so highly you may ask? What’s my angle here? Should you be suspicious? Yes you should. I have an ulterior motive in recommending this book. I firmly believe that if everyone read this as part of the national curriculum obesity would be a thing of the past. I know its 300 hundred pages. It’s a monster; you could build biceps worthy of any action hero just lifting it. Burn the Fat, Feed the Muscle is the most complete guide to weight loss, scratch that, nutrition anywhere bar none. It is flawless, save for the actual length of time necessary to read it, and even that has its benefits, as it allows the reader time to digest each step. I’m going to go through this step by step and explain why everyone, regardless of your goals should read this book. It begins with an email. If I had to get someone to an expert level of nutrition blended with common sense, practical, down to earth advice…what would I recommend? – Burn the Fat, Feed the Muscle by Tom Ventuo...and that‘s what I did. From the first chapter Tom gets it right and before he addresses diet he addresses something more important - Your mindset. He teaches you how to establish goals and motivational techniques. These are the same techniques I use to motivate my clients to incredible success. They work, but very few people apply them. Do it – it works, plain and simple. The book focuses on each aspect of nutrition from carbohydrate intake, protein, fats, water (yes, he actually shows you how to figure out how much water you should drink a day...and believe me that will surprise you) and more. He explains in simple clear cut terms all the fancy tricks we personal trainers use to get people in great shape, and most importantly he makes it accessible for everyone. I’m going to hold my hands up here and say this right now – I base most of my diet and meal templates on Burn the Fat, Feed the Muscle. This book is my nutrition Bible. I printed it out, read it, wrote notes on it, re-read it and live by it. It sits beside my desk, dog-eared and worn. It is one of the best fitness purchases I have ever made. 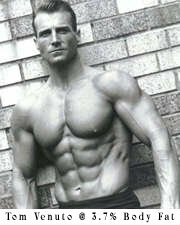 I have numerous qualification in health and fitness and a dozen in nutrition. I’ve studied countless manuals and spent thousands learning every aspect of diet and nutrition to cater for mass building to fat stripping. And I wasted my time and my money. It’s all in one book – Tom Ventuo’s Burn the Fat, Feed the Muscle . I’m not going to say much more, I could keep writing, but I’ll let Tom take over from me. You can see the full contents and how it can help you Here! Click here to learn about Tom’s follow up to Burn the Fat, Feed the Muscle his awesome audio program!